I have just publish the second timeline of March (the first is here), so I can now compile the statistics for this month. As I mentioned, this month has seen for the first time in 2018, a decreasing trend in the number of events: this is clearly visible from the Daily Trend of Attacks chart, which shows a clear drop in the second half of the month. But the month of March has also seen a sharp drop of the events motivated by Cyber Crime. 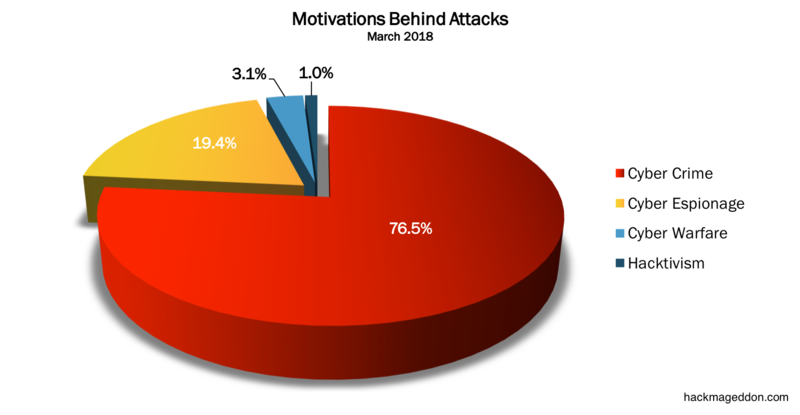 Despite they rank on top of the Motivations Behind Attacks chart as usual, this category experienced a slide to 76.5% from 86.4% in February. The ten point went probably to Cyber Espionage, whose event rose to 19.4% from 9.1% in February. Cyber Warfare also rose to 3.1% from 0.8, while Hacktivism recorded a single event, leading to a modest 1%. Malware confirms its leadership of the Attack Vectors chart with 39.8%, showing a slight increase from 31.8% recorded in February. Account Hijackings are stable at number two with 18.4% (it was 24.2% in February), whereas targeted attacks confirm their increasing trend with 16.3%, up from 2.1% of February. It is interesting to notice that unlike, the previous months, only five categories of attacks have been recorded this month.